With the Google Shopping transition completed on October 17, all of Google’s organic, free product listings — those that showed a product thumbnail and price in search results — disappeared. If you want your product listings to appear in Google, you now have to buy Product Listing Ads through AdWords. As discussed in “Google’s Product Listing Ads: Cheaper, More Profitable,” my August article, I consider PLAs — i.e., Product Listing Ads — essential for any merchant who advertises through AdWords. The good news for you, however, is that far too few merchants are taking my advice. 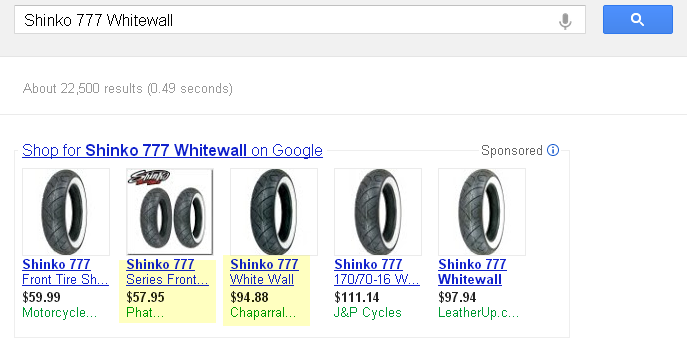 Recently my firm inherited the AdWords campaign of a merchant that was able to generate 1 cent PLA clicks. A dollar bought the merchant 100 clicks and $664 in revenue. By increasing the PLA bid to 5 cents, its budget increased to just $28, and its revenue skyrocketed 1100 percent, to $7,503. Examples like this haven’t been common since the early days of AdWords. But across the board we’re seeing merchants take advantage of unusually cheap yet highly profitable clicks by optimizing their PLA campaigns. What makes this possible, in large part, is that most merchants have not caught on to the power of PLA campaigns. Eventually they will. But those merchants who catch on early have the potential to hit record revenue and profit numbers this holiday season. I met with our pay-per-click managers in preparation for this article to compile the following tips for merchants who want to optimize their PLA campaigns. Tip 1: Become a Google Trusted Store. This first tip may seem obvious to many merchants, but for those who don’t know, Google Trusted Stores get a special distinction in the search results page — see the check beside “Luggage” and “eBags” below. This has the power to increase both click-through rates and conversion rates. "Luggage…" and "eBags…" are Trusted Stores. Tip 2: Use AdWords labels when creating your product feed. When you upload your data feed to Google, you can tag items with labels that enable you to fine-tune your campaigns within AdWords. A simple use of labels would be marking your high-margin products, so that you can bid more aggressively on those items. A more advanced use of labels might include marking your low cost products within a certain category. For example, let’s say you sell motorcycle tires. 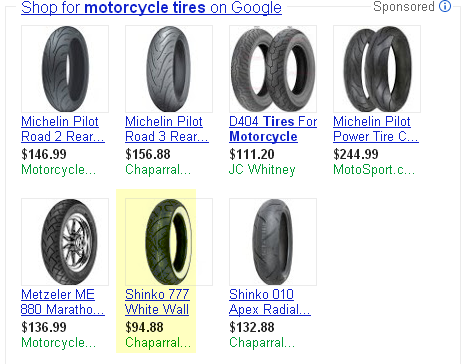 You might mark the cheapest motorcycle tires with a “low cost” label, and then bid on them aggressively in AdWords. As a result, when a shopper searches for “motorcycle tires,” the tires you sell that come up will often be cheaper than the tires that accompany your competitors’ listings. See the screen shot below — the low price of $94.88 stands out against the other products. That can result in more clicks and higher conversions. It can be a powerful strategy depending on your product category. The low price of $94.88 stands out against the other products. Tip 3: If you’re a low cost player, shop competitor prices constantly. When a shopper intends to buy a commodity product, price is often the biggest motivator. 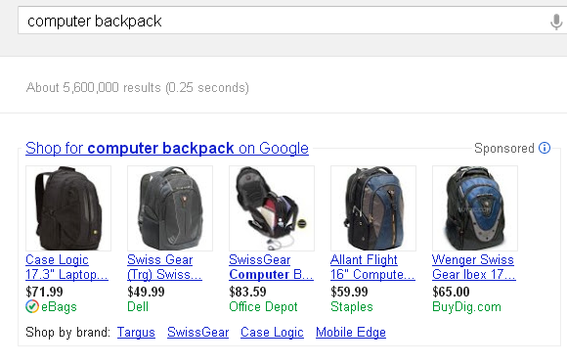 Google will now show shopping results more frequently and these results make it easy for shoppers to compare prices. Sometimes being a dollar or even a penny cheaper can be the difference between winning and losing a sale. Consider a search for the “Shinko 777 White Wall” highlighted in the screen shot above. When you search on that term, these are the results that come back, below. “Phat…” and “Chaparral…” appear to be advertising slightly different product options. But of similar options, those two are the cheapest. “Motorcycle…,” “J&P Cycles…,” and “LeatherUp.c…,” are disadvantaged. Tip 4: Use the AdWords “Publish” label. As inventory changes, as products go in and out of season, and as certain products become less profitable than others based on click costs and conversion rates, you may be tempted to constantly pull out and then add back products into your data feed. A more efficient approach is to use the AdWords Publish label to simply mark a product as “true” or “false.” True means the product will be eligible for PLA advertising. False means it will not. You will have more control to fine-tune your campaigns by having the power to quickly turn some products off, and others on, as new strategies are tested. Tip 5: Use good product images that scale well. Let’s say you are in the market for a new computer backpack, and you start with a Google search that brings up the following product thumbnails. Product images from the search "computer backpacks." For me, the most appealing image would be a tie between the ones from Dell, Staples, and BuyDig. Last on my list would be the one from eBags, because it’s very difficult to understand. It’s simply a black backpack with no distinguishable features. Now that Google will be scaling down your thumbnails, and placing them at the top of the search result page, it’s more important than ever to have photos that look good even if they are scaled down to a very small size. It’s likely that the new Google Shopping will be a welcome surprise for merchants that take advantage of PLA hits holiday season. Implement the tips above to optimize the performance of your PLA ads, and then stay-tuned for the recap articles I’ll post next year. We’re experimenting with other optimization tips that could be very powerful as well. I’ll address them after the holiday season.